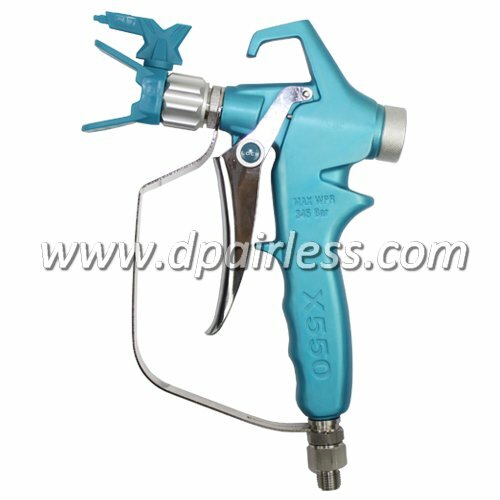 X-450 airless spray gun is upgraded model with high quality, very light weight (only 460g), and very soft grip spray gun, for spraying both water-based and oil-based coatings. Same quality as American or European spray gun. 1.Applicable for spraying both water-based and oil-based coatings. High quality solvent-resistance sealing ensures that it can spray almost all kinds of common coatings. Gun body is forged with fine aluminum alloy and other components are die casted, reaching high pressure-resistance level. 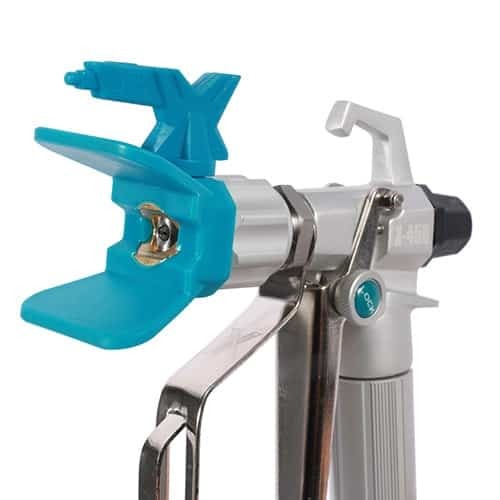 Overall dimension is smaller than most common airless spray guns in the market, but with enough space for holding the gun comfortably, suitable for men or women doing the spraying jobs using hand or wearing gloves. Light weight and handy, no much fatigue after long-time spraying. 5.Hand force to open the trigger, 15N only. Feel light and handy to open the trigger, easy and comfortable, soft trigger operation, all make the spraying job comfortable and no fatigue. 6.Trigger is with safety pin, preventing for starting the gun by mistake. 7.Safety pin could also be used for switch for keeping the gun spraying continuously for long time without pushing the trigger with hand. 8.Swivel free hose connector for easier rotating to any direction. 9.Unique designed needle with long lifetime, and easy changing. Color: Silver (standard color), Gold / Black / Blue / Red …. available with MOQ of 500pcs quantity.